Well yeah. I found a new love and it´s called Death Knights. 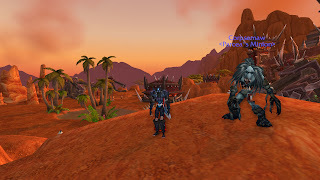 Didn´t like them before when i first tried the out somewhere in the middle of Cataclysm. Yeah I haven´t been playing WoW for so long. I started about two months before Cataclysm came out, so I´m still a bit of a noob right? I tried out a few races and class at the start and fell in love with some. Sadly the only character I still have left from the beginning is my troll hunter that´s sharing the main spot with my belf priest. When I was able to try out a Death Knight I was so extatic since they sounded cool. Well... My first Death Knight came to Zangarmarsh before I grew tired of her and felt that Death Knight perhaps wasn´t for me. This is my second try at Death Knight and I don´t understand why I didn´t like them? Could it be because you did´t get the bond with the character since you didn´t get to level it from lvl 1? That´s what I think was my problem. You started of at level 55 and didn´t have the time to learn how to play your class as with those you start at level 1. But now it doesn´t feel that bad. Why? I´ve got a addon that helps me to understand what skills should be used. Some of you might think I´m beeing lazy now, but I would say I´m not. I still read what my skills do, still do reserch on what stats I need and if there is something I should be doing at some bosses. I don´t depend to a 100% on this addon, I only use it as help for when I don´t know what to cast on the bad guys. Currently she is still in the gear from the starting point. Why? Well it seems that I don´t find something that´s better. Her name is Parcea and she´s a undead Death Knight. And at the moment I´m trying to level up her professions mining and jewelcrafting. So far she can only mine copper.. Yeah... But that will be changed today. Don´t know how far she´ll get today, but I´ll be happy no matter what she´ll be at the days end.